Little Moreton Hall is a striking Tudor mansion in Cheshire UK, which is operated as a tourist attraction by the the National Trust. It started out as a modest property but was extended over the years to the large building you see today. The origins of the hall stretch back to the early 1500s when this was essentially the home of the local land owner. It remained in the same family for around 450 years and was passed to the National Trust in the 1930s. When you approach the hall from the car park, it looks out of place in today’s world although it’s been there longer than everything around it! The National Trust describes it as a ‘gingerbread’ house lifted straight from a ‘fairy story’. The moat that surrounds the house adds to this image. To get the most out of your visit, we’d recommend that you take one of the free regular tours which are led by volunteers. They will explain what you’re seeing in each room and the history and significance of the house. You’ll learn about the beautiful bay windows which were added, the various extensions over the years, the political history of the family and their friction with the parliamentarians. Also, spend a little time in the chapel and wait for the other visitors to leave. To us,it felt like the most peaceful and reflective part of the house – even on a busy day. Everything a chapel should be! 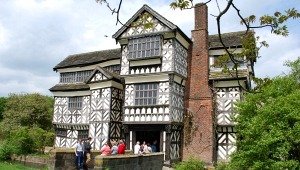 Little Moreton Hall has various opening times through the year. At peak times it’s open daily, at other times from Wednesday to Sunday, closed completely in January and only weekends at other times. Normal opening hours are 11am to 5pm and adult admission is £7.20 (2013 prices) and is well worth it! Little Moreton Hall is just off the A34, halfway between Kidsgrove and Congleton.